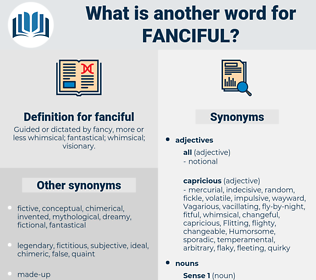 What is another word for fanciful? Guided or dictated by fancy, more or less whimsical; fantastical; whimsical; visionary. 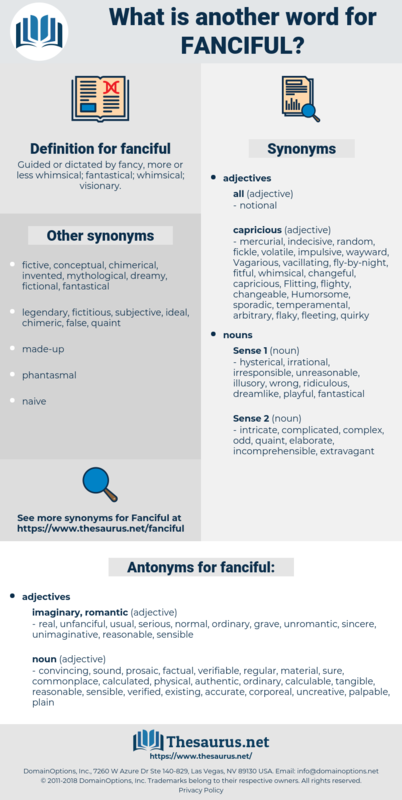 whimsical, imaginative, fancy, extravagant, frivolous, flamboyant, outlandish, wild, capricious. real, unfanciful, usual, serious, normal, ordinary, grave, unromantic, sincere, unimaginative, reasonable, sensible. commonplace, sound, palpable, plain, existing, solid, factual, believable, prosaic, accurate, calculable, physical, verified, authentic, material, corporeal, verifiable, uncreative, calculated, tangible, regular, convincing, sure. She did, however, look oftener than ever to the door during the evening, with a vague expectation that her father would appear: and she persuaded Mr Cunningham to repeat again to her all he had before said of the probability of his arrival at any moment; while Mrs Herbert, also, listened eagerly, and laughed at herself for being as fanciful as Amy, though her heart beat quickly at the slightest unusual sound in the house. But it's a merely fanciful suggestion and has no foundation in reality.